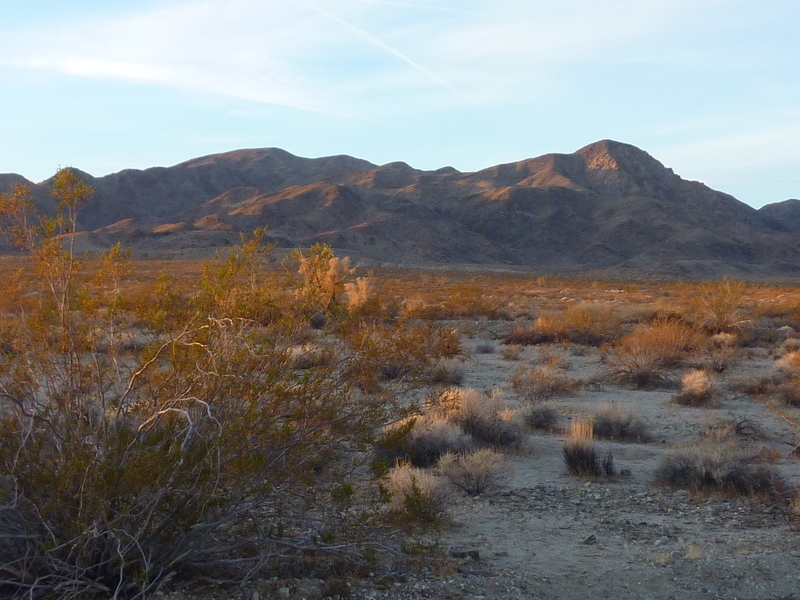 I drove into Joshua Tree NP from 29 Palms in the early morning hour before sunrise, driving to the turnout in Pinto Basin on the edge of the Hexie Mountains. I had climbed the highpoint some years earlier, but came back to tackle a handful of unnamed summits in the northeast part of the range. The highest of these had more than 700ft of prominence, but otherwise I picked them because it looked like I could make a nice day's outing of tagging them all. The terrain of the Hexie Mtns is very conducive to easy strolling along the ridgelines. The footing is good, there is little loose rock, and the cacti are not plentiful. The canyons and gullies are a bit spicier, lots of easy scrambling, some dry waterfalls to avoid, lots of catclaw and other brush to keep things interesting. The shoulder along the roadway is very narrow, making parking off the road difficult, which is why I chose to use the Turiey Flats trailhead, a little further than the closest approach point. The first mile and a half crosses flattish desert terrain, easy walking. Finding myself much further west on the way out, I had 2.7mi of the flats to cross in returning, mostly against the grain of the drainages making it less pleasant in that direction. It took an hour and three quarters to cover the first 3mi+ to Mary BM. Along with the battered benchmark was found some desert wire art and a couple of registers attesting to the peak's surprising popularity. Richard Carey had left the smaller book in 2009, it's 27 pages filled in only seven years. The second book, placed in 2016, showed the most recent visitor to have been only five days earlier. Another hour to the southeast saw me to the highest summit of the day, unnamed Peak 4,251ft. This, too, had a register, though far less popular. My route turned toward the southwest, along the meandering ridgeline connecting to Peak 4,168ft that took another hour and a quarter. By now I was 3hrs from the trailhead and fairly remote in the range - no surprise there was no register here. The summit is not as well defined as the first two and I had to explore a host of possible highpoints along the broad summit line. It was just after 11a and I was doing far better than I had expected. My original plan was to return north down one of the wash drainages back to Pinto Basin and the car, but since I had so much daylight remaining I decided to continue on to the yet more remote Peak 3,900ft. To the south, across the broad Porcupine Wash (do you think a porcupine could live here?) is the unnamed highpoint of the Hexie Mtns. My route heading west to the fourth peak would follow the high ridgeline on the north side of this wash. The ridgeline meanders a good deal here and I shortcutted it some to the south to take a more direct line. I was surprised to find an old mining road so far back in the hills as I was nearing Peak 3,900ft. The road is depicted on the older 15' topo map and showed some care in its construction with rock-lined edges on the downhill side to support the roadway. I followed the road for a short distance heading north before turning left to for the remaining 2/5mi to Peak 3,900ft. It made for a nice little perch with views across the range, a very remote feeling as I was still 3hrs from the car. I returned to the old road and followed it to its end at some prospects to the northeast. There doesn't seem to have been any significant mining activity to justify the building of the road, but this seems standard practice back in the day - build it and the ore will come. Maybe. After leaving the prospects, I started descending into one of the wash systems, shallow and a bit brushy at first, eventually deepening and becoming sandier and more interesting the further I descended. The last hour across the desert flats was less pleasant than that earlier in the day, thanks to the across-the-grain terrain. It was nearly 3:30p by the time I finished up.